Dr. Wells – a pepper-style soda – was introduced in 1935 to compete against Dr. Pepper and its many imitators. Developed by Ludford Fruit Products of Los Angeles, California, which was also the national headquarters for Alka-Time and Hollywood Beverages. 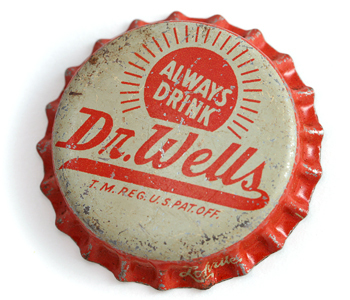 Dr. Wells was acquired by the Monarch Beverage Company of Atlanta in 1987, then changed hands again in 2007, when it was sold to Hedinger Brands (Jasper, IN) and licensed to The Dad’s Root Beer Company. Dr. Wells is still produced and is available in 12oz cans, 20oz plastic bottles and 1-liter plastic bottles. It is available on fountains in “select” markets in the US.